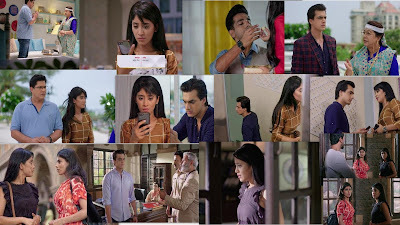 Home Yeh Rishta Kya kahlata Hai Yeh Rishta Kya Kahlata Hai 25th June 2018 Episode Written Update"Naira-Kartik's Video They are Blackmailed"
Yeh Rishta Kya Kahlata Hai 25th June 2018 Episode Written Update"Naira-Kartik's Video They are Blackmailed"
Episode starts with Naira doesn’t get to see the complete video sent in the college group. She doesn’t learn Kartik’s view on Tanvi’s matter. She misunderstands him again. Naitik meets Dadi and tells her that Naira is not at fault. He asks Dadi to understand and explain Kartik also. Dadi doesn’t show any interest in talking about Naira. Naitik turns upset seeing her behavior. Naksh gives a pretty necklace to Kirti and surprises her. He gives the good news that his resort project will get completed soon. He promises her that she will always be his priority. He tells her that he may get busy in work. She tells him that she understands his work needs. Dadi gets into an argument with Vaidehi, who settles scores with Dadi after knowing the college incident. Vaidehi blames Dadi for doing injustice. Kartik asks the matter. Dadi tells him that the society people are troubling them. Naira learns the matter and asks Naitik to help Goenkas. Naitik asks Vaidehi about her move. Vaidehi complains that Kartik and Dadi are doing wrong in the college. She tells them that Kartik has rusticated Naira from college Naira tells Kartik that she didn’t tell anything to Vaidehi. Kartik asks them to take any decision, but know the right thing first. He clears the fact that he didn’t rusticate anyone and challenged the Dean’s decision so that the students don’t get upset with the management. Vaidehi apologizes to them. Naitik too apologizes to Dadi for inconvenience. Kirti learns Naksh’s financial problems and wonders why is he hiding it from her. Naira and Kartik get a huge shock when they receive their pool MMS. A stranger blackmails them and asks them to withdraw Tanvi’s case. Kartik hides the matter from Dadi. Naira rushes to Kartik to take his help. Kirti confronts Naksh for hiding his problems from her. She asks him if he doesn’t trust her. She tells him that she believes that he is capable to handle the troubles, but he could have shared it with her so that she could emotionally support him. He tells her that he doesn’t want her to worry and even Naitik is busy with Naira. He justifies why he is dealing everything alone. Kirti asks Naksh not to be jealous when Naitik is with Naira. He tells her that she won’t understand him. Kartik and Naira meet and share the MMS. They don’t get scared of the MMS, but don’t know anyone else to receive the video. Dadi and Naitik worry that something happened that Kartik and Naira rushed out of homes. Naira tells Kartik that she will not leave the blackmailer. He tells her that he will talk to the inspector. They both have a cute argument like before. Naira encourages Tanvi. She tells Tanvi that Kartik will do something. She learns that Kartik has withdrawn the case for Tanvi’s dignity and college reputation. Kartik makes a plan to spread the fake news in the college so that the students get calm. He wants to catch the culprit by laying the trap. Naira thinks Kartik got scared of the blackmailer. Kartik tells the board that he won’t take the case back and get justice for Tanvi. Naira tells Tanvi that they will nab the culprit by offering him money. Kunal tells Naira that he can help her in nabbing the culprit. Kartik Announces That They Caught the culprit This is All Plan By Kartik So that They Can Find the Culprit.Kunal is With Tanvi and Naira.Kartik-Naira Look at Each other.